Do you got tired or dazzled eyes when you work late at night on your computer. And you are struggling to find a way to get your screen more darker or find out you can not decrease the brightness of your screen. 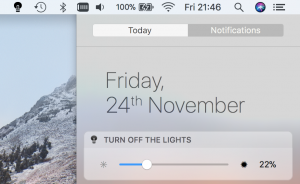 You can use the Turn Off the Lights for Desktop (available for macOS and Windows). With this desktop application you can dim everything on your desktop screen with a single click on the lamp button. 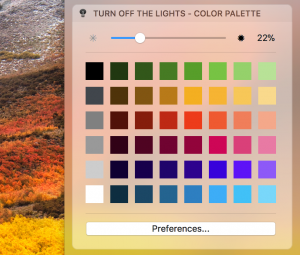 Now the experience gets even better, you as user can install the new Brightness Control, and Color Palette notification widget (only available in macOS). With a swipe from right to left, you open your macOS Notification Center, and on a click on one of the colors you change it live the dark transparent layer. From the widget can change this dark layer color, and his opacity value. If you want to customize more elements than you can open the Turn Off the Lights Preference window by clicking on the white button “Preferences…”, that is visible below the color palette. You can also keep it simple and to show only the opacity slider in your macOS Notification Center. In this brightness control widget you can increase and decrease the opacity of your transparent dark layer. If you move the thumb to left of the slider, you decrease dark color that is added on top of your computer screen. When you move the thumb more the right side, you increase the value and makes the screen darker. To learn more about how to add this widget in your Notification Center sees this help center page from the Apple website. 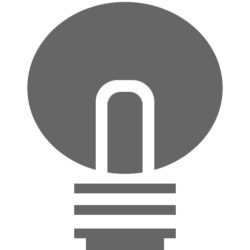 Have you not tried out the Turn Off the Lights for Desktop app? Try it today the Turn Off the Lights for Desktop Mac App that is available in the Mac App store. And for Windows users in the Microsoft Store.